Theotokos (Greek: Θεοτόκος, translit. Theotókos; Latin Deipara, Dei genetrix; Slavonic: Богородица translit. Bogoroditsa) is a title of Mary, the mother of Jesus, that is used in the Eastern Orthodox Church and Eastern traditions of the Catholic Church. Its more precise English translations include "God-bearer" and "the one who gives birth to God"; those less precise or less literal include "Mother of God Incarnate" and "Mother of God." Throughout Christian history, Mary has been venerated for her role as the birth mother of Jesus. The Bible describes Mary as being selected by God to give birth to the savior, and she is depicted as being a loyal and caring figure in the infancy and crucifixion narratives of the Bible. The epitome of Mary's reverence can be seen in the development of the concept of Theotokos, which acknowledges Mary's supreme human role in giving birth to the savior. However, the term "Mother of God" caused a great deal of controversy in the early church (See Nestorianism) as some Christians found it to be a blasphemous doctrine. Mother of God (ΜΡ ΘΥ), mosaic icon, Hagia Sophia. Theotokos is a compound of two Greek words, θεός "God" and τόκος "childbirth." Literally, this translates as "God-bearer" or "the one who gives birth to God." However, since many English-speaking Orthodox find this literal translation awkward, in liturgical use "Theotokos" is often left untranslated, or paraphrased as "Mother of God." 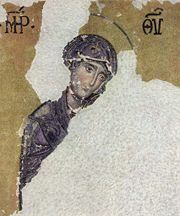 This latter title (in Greek Μήτηρ Θεού) has an established usage of its own in certain hymns, but especially on icons of the Theotokos, where it is usually abbreviated as ΜΡ ΘΥ (see illustration inset). However, "Mother of God" and "Theotokos" are not exactly synonymous, as the former describes a family relationship but not necessarily physical childbearing, which is expressed by the latter. This means that Mother of God must be understood by the person employing the term, as not referring to Mary as Mother of God from eternity but rather only with reference to the birth of Jesus, that is, God's birth on earth in flesh. By contrast, Theotokos makes this information explicit, thus excluding any misunderstanding of Mary's divine maternity. The title "Theotokos" specifically excludes the understanding of Mary as Mother of God in the eternal sense. Christians believe that God is the cause of all, with neither origin nor source, and thus without mother. This stands in contrast to classical Greco-Roman religion in particular, where a number of divine female figures appear as mother of other divinities, demi-gods, or heroes. For example, Juno was revered as the mother of Vulcan; Aphrodite, the mother of Aeneas. On the other hand, Christians believe the Son of God is begotten (born) of God the Father from all eternity (see Trinity and Nicene Creed), but is born in time of Mary, the Theotokos. "Theotokos," then, refers to the incarnation, when the divine person of God the Son took on human nature in addition to his pre-existing divine nature, this being made possible through Mary's cooperation. Since mainstream Christianity understands Jesus Christ as both fully God and fully human, they call Mary "Theotokos" to affirm the fullness of God's incarnation. The Council of Ephesus (431 C.E.) decreed, in opposition to those who denied Mary the title Theotokos ("the one who gives birth to God") but called her Christotokos ("the one who gives birth to Christ"), that Mary is Theotokos because her Son, Christ, is one person who is both God and man, divine and human. As Cyril of Alexandria wrote, "I am amazed that there are some who are entirely in doubt as to whether the holy Virgin should be called Theotokos or not. For if our Lord Jesus Christ is God, how is the holy Virgin who gave [him] birth, not God-bearer [Theotokos]?" (Epistle 1, to the monks of Egypt; Patrologia Graeca 77:13B). Thus the significance of the title "Theotokos" lies more in what it says about Jesus than in what it says about Mary. In the Orthodox church, because of the significance of Mary's status as "Theotokos" to Orthodox doctrine, it is defined as one of only two indispensable dogmas relating to her. The other is that she is a Virgin; cf. Nicene Creed. Other beliefs about Mary are expressed in the worship of the Orthodox Church but are not formally dogmatized or made a precondition of baptism. Many Church Fathers used the title Theotokos for Mary, at least since the third century C.E..
Often Origen (died 254 C.E.) is cited as the earliest author to use the title Theotokos for Mary but the text upon which this assertion is based is not genuine (Socrates, Ecclesiastical History 7.32 citing Origen's Commentary on Romans). The use of Theotokos was formally affirmed at the Third Ecumenical Council held at Ephesus in 431. The competing view (advocated by Nestorius, then Patriarch of Constantinople) was that Mary should be called Christotokos, meaning "Mother of Christ," to restrict her role to the mother of Christ's humanity only and not his divine nature. Nestorius's opponents, led by Cyril of Alexandria, viewed this as dividing Jesus into two distinct persons, one who was Son of Mary, and another, the divine nature, who was not. Such a notion was unacceptable, since (in the Orthodox view) by destroying the perfect union of divine and human nature in Christ, it sabotaged the fullness of the incarnation and, by extension, the salvation of humanity. Nestorius's view was anathematised by the Council as heresy (see Nestorianism), and the title "Theotokos" for Mary was affirmed. "the holy fathers…have ventured to call the holy virgin [T]heotokos, not as though the nature of the [W]ord or his divinity received the beginning of their existence from the holy from the holy virgin, but because there was born from her his holy body rationally endowed with a soul, with which the [W]ord was united according to the hypostasis, and is said to have been begotten according to the flesh" (Cyril's second letter to Nestorius). By the end of his life, Nestorius had agreed to the title Theotokos, stating the apparent communication of the attributes (idiomata). Calling Mary Theotokos or, for that matter, "Mother of God" (ΜΡ ΘΥ) was never meant to suggest that Mary was coeternal with God, or that she existed before Jesus Christ or God existed. Rather, her divine maternity is only in regard to the mystery of the Incarnation. The Church acknowledges as much in the words of this ancient hymn: "He whom the entire universe could not contain was contained within your womb, O Theotokos." 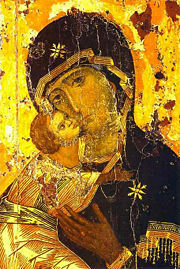 The title "Theotokos" continues to be used frequently in the Eastern Orthodox, Eastern Catholic and Oriental Orthodox churches. For example, the hymn Sub tuum praesidium (English: Under your protection) is the oldest hymn to the Theotokos dating from the third century C.E.. It was first used in the Coptic Christmas Liturgy, and is still used to this day in the Eastern Orthodox Church. Versions of this prayer also occur in the modern Ambrosian, Roman, and Byzantine and Coptic liturgies. Theotokos Panachranta, illumination from the Gertrude Psalter. ↑ Savas J. Savas, Hymnology of the Eastern Orthodox Church (Rowman & Littlefield, 1983), 22. See also the famous Akathist Hymn of St. Romanos.